The motivations and goals for gardening are different for everyone. Whether it’s the beauty of foliage and flowers, fresh vegetables, curb appeal and property value, or just some time outdoors away from electronics, the benefits are the same. Gardening provides exercise, stress relief, connection with nature, and a sense of accomplishment. No matter your motivation for gardening, a gardener requires a few good tools. A well-kept garden journal can be as valuable as a good shovel or sharp pruners. A good journal can come in many forms and will often take on the personality of the user and their interests. Digital versions can be spreadsheets or quick notes on a calendar app. There are also dedicated journal apps available for all operating systems and devices. Most gardeners still enjoy the pen and paper method. Elaborate, bound versions specifically for gardening exist, however a simple notebook will suffice. My friends, Jim Satterfield and Sandra Garber start their journal each year by printing tabled pages in Excel. They fill the days with their appointments and important dates as well as garden events and sightings. The back side of each page is for the pictures they take in the garden that week. At the end of the year Mr. Satterfield binds the pages and makes lovely hardbound books that are theirs for reference. When you start a journal, it is good to capture information about your site like sun exposure at certain times of the day, where water tends to flow or pool, and where you like to spend the most time. A plan view sketch of the garden or property is also a valuable thing to include. Make sure to mark things like utilities, septic fields, and power lines, as these will affect what you can do with plants in these areas. Think of a journal as a gift to your future self. If you are like me and like to try new and obscure vegetable varieties each year, a journal may be the only way to remember which ones are worth buying again when seed catalogues show up months after your last fresh tomato sandwich. 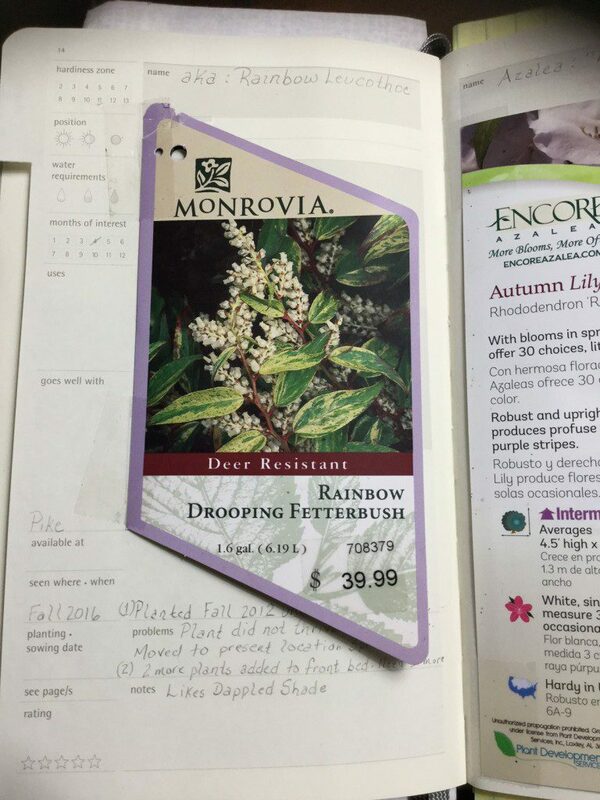 Many gardeners have told me they put the entire label or seed packet in the book with little more; however, you might at least include when you planted it. This will help to remind you which plants were garden stars or duds. Including notes on how it performs in relation to insect and disease is similarly important. Many gardeners also make notations on when they divide their plants and whom they share with. Weather related information like rainfall, frosts, and temperature can also help guide your future garden tasks and better understand issues in the landscape when they arise. Seasonal information like blooming, bird arrivals, and leaves turning make good things to record as their various stages are related to the climate in our area. The information you collect can be valuable for citizen science projects like Project Budburst, www.budburst.org. Project Budburst is an online, citizen science project where participants around the country report phenology phases of plants. This information helps scientists monitor trends and better understand weather and climate’s impact on plant species. A calendar view can be very helpful to remind you of garden tasks that are seasonal and somewhat time sensitive. I like to jot down things like spray schedules for fruit trees, fertilization, and windows for pre-emergent herbicide. Now, I will not say that I manage to complete all of these things, but they certainly serve as a good reminder when I am making my weekend list of to-dos. I also set reminders for important dates like the start of the summer burn ban so I can ensure my pile of branches from winter pruning does not become a neighborhood eyesore. A garden journal can also potentially provide some clues as to why a plant has not thrived or survived. As a county extension agent, I have found the information people provide from their journals to be an invaluable source for finding potential reasons for plant problems. The process of reflection and observation in your journal will only increase the mental and spiritual benefits of gardening. So do your future self a favor and start a garden journal today. Posted in Flowers, Fruit, Home Gardening, Home Landscape, Master Gardeners. 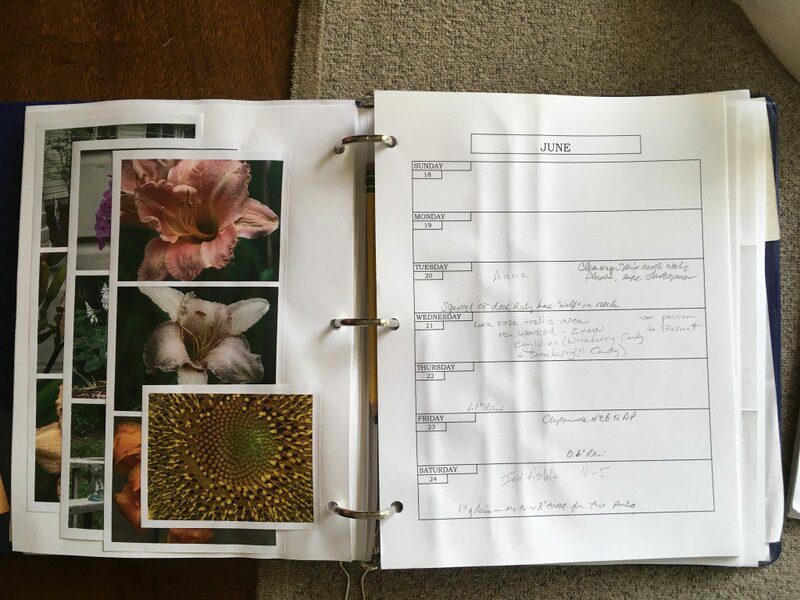 This entry was tagged garden journals, journals, plant labels, recording garden activities. Bookmark the permalink.